The Dholes House has an 'online dice roller' that may be useful to members. All dice rolls are logged and can be verified and searched in an archive. A Dholes House account is not required to use the Dice Roller but only 2 'anonymous' rolls per day are allowed." 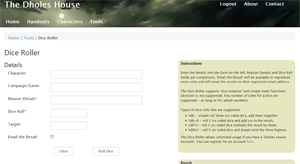 All dice rolls are saved and can be viewed in the Dice Roll Archive. 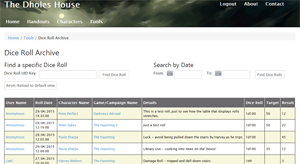 The Archive can be searched by date and filtered by User, Investigator and Game/Campaign name. It's also possible to pick a roll from the database by using the 'verification key'. All dice rolls have a 'verification key' generated when rolled. Using this key will confirm the details of the dice roll - a handy feature for games played on forums, via email or other methods. 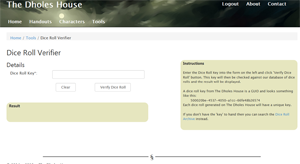 This page will display a dice roll based on the verification key entered.